At £499, there's really no excuse not to join the 12-string club with this great guitar. Nice choice of tones. Chords sound superb. Great value for money. Easy to play. 12-string guitar should be familiar to all, as should the wonderful tones they provide. Be they acoustic or, as in the case of this Dano, wholly electric, they can inspire you and your playing to greater heights simply by injecting a unique feel and texture into tired licks. The DC59TSB-12 is strung traditionally, that is with the octave strings set above the conventional sextet, and secured by a fully adjustable bridge at one end and a brace of chrome tuners at the other. 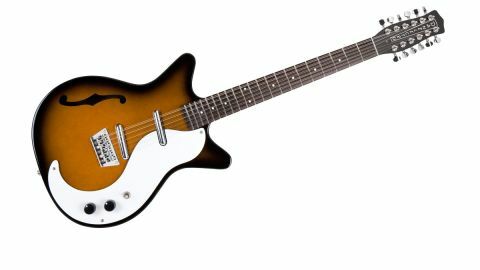 "Put simply, this may well be one of the best electric 12s we've played"
The maple neck is customarily finished in black and sufficiently wide to accommodate the strings without straying into ironing-board territory, and we found the guitar very easy to play for both chords and single notes. As mentioned, the body is made from Masonite and follows the established Dano Shorthorn style, although here there's an f-hole, too. A pair of lipstick pickups add to the jangle, and a three-way toggle and volume and tone pots give you all the control you need. It won't be long before that cream binding starts to peel, but otherwise, the construction is fine. Acoustically, the guitar is loud and, upon plugging in, you soon discover what the fuss is all about: put simply, this may well be one of the best electric 12s we've played. Full open chords possess just the right jangle-to-body mix and you can either opt for a nicely metallic character from the bridge pickup, or more mellow tones from the remaining two selections. Rush, Alice In Chains, Queen, Bob Dylan and even Pantera have used 12-strings to great effect and, at £499, there's really no excuse not to join the club with this great guitar.